We’re seen quite a number of savvy agents from all across Western Australia signing up, only a few months ago, we hit our $100 Million property sale, and now, our local Industry body, The Real Estate Industry of WA (REIWA) President recently published an article detailing his thoughts on our revolutionary new way of exchanging property. It’s an encouraging sign for both us, and to you- our Real Estate colleagues- that Openn is being seen as a driver of benefit for buyers, sellers and agents alike- a goal that has always been at the heart of its conception. After all, it’s made by agents, for agents. In the digital world that we live in today, where technology comes and goes, it’s reassuring to witness such a large response from our industry towards the Openn Negotiation process- one which indicates that this new way is making a positive difference out in the market. 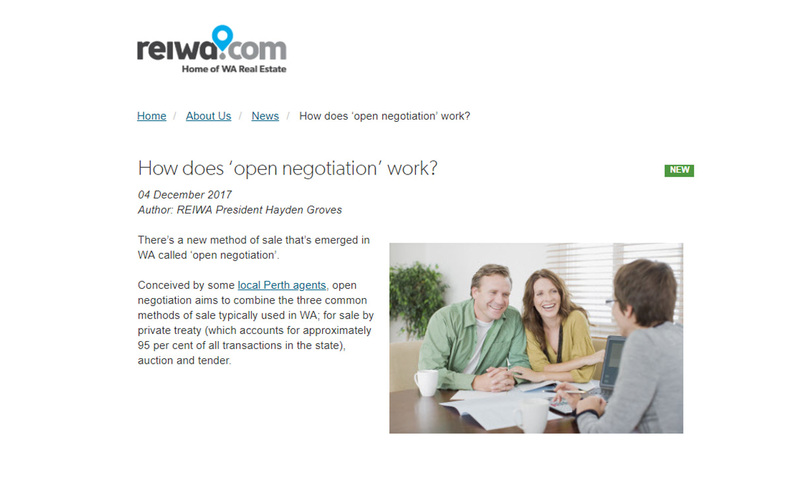 “Conceived by some local Perth agents, Openn Negotiation aims to combine the three common methods of sale typically used in WA: for sale by private treaty (which accounts for approximately 95% of all transactions in the state), auction and tender. It’s encouraging to have industry support when it comes to having an open mind about a new method, and given the impressive uptake across WA, we believe Openn Negotiation has an exciting future ahead. We look forward to the next few months when we roll out the Openn platform across Australia, and can’t wait to educate and train agents on this new and exciting future of real estate sales.